Once again Wesabe makes it easy on me to find something to write about. In the last update they included my suggestion for a cropping tool in their latest version of the firefox plugin (1.0.5). After you auto upgrade to the latest version you can click and drag a crop box around the area you want to snag and when you release you’ll get a prompt confirming that’s what you wanted to do. After the prompt you’re presented with your cropped image and the same options to save to to Wesabe or to your own computer. Today marks the launch of the latest edition to the KnightKnetwork of sites! 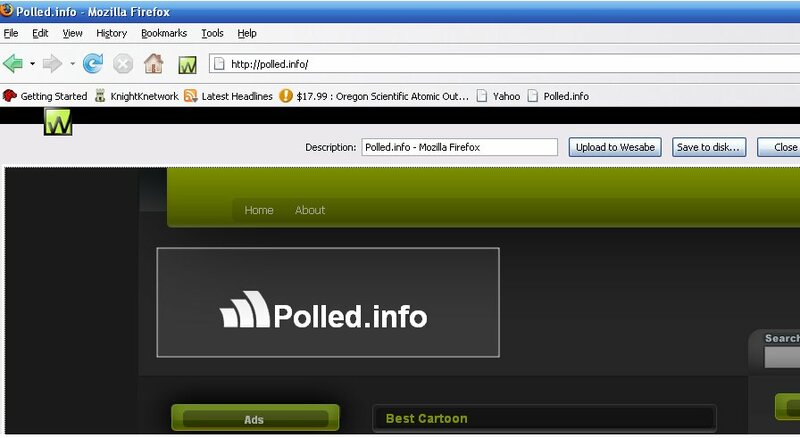 Polled.info has come together thanks mostly in part to me staying up too late, seeing the name was available for $2.99, and liking the sound of it. For now the site will feature several polls a week using Amazon’s Unspun technology. Polling is a pretty interesting subject to explore so the site will expand as my polling knowledge does and as time allows. For the launch I’ve pulled in a poll about the best movie ever, inspired by a recent conversation I had about the AFI’s top 100 movies. Make sure to drop by Polled.info and express your opinions by voting up or down the items on the list!